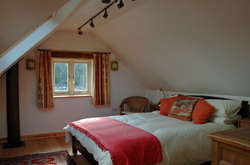 Gorge View Cottage is ideal for one person or two people sharing. it has been very recently wholly rebuilt and refurbished as a fully detached cottage, using great care in design and materials to ensure environmental performance, without losing the natural charm of the building. Facilities include a fully fitted kitchenette in reclaimed wood, FSC oak flooring, best-in-class appliances, mostly high-performance LED lighting throughout, triple glazed upper windows, PV Solar electricity, rainwater harvesting (for the garden), underfloor heating and a great log stove with integral oven for those colder nights (check out the good value basket of logs option). Paints and materials were all chosen for their environmental credentials. 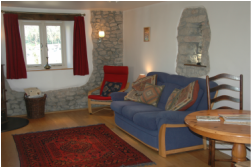 The house has a Freeview flatscreen TV and DVD player and, if wished, free fibre-broadband fed wifi throughout. There is off-road parking for a car, or motorbike, and secure parking for bicycles. Sadly we cannot accept children or pets and we have a strict no smoking policy. A comfortable and beautiful triple aspect space with oak flooring and rugs, and exposed stone walls. Furnishings include a sofa, comfy seat, dining table and chairs and storage in a range of reclaimed wooden units and understairs. There is an excellent wood burning stove and if you want we can supply a big basket of logs and all that's needed to start the stove (see optional fire pack). And of course there are views to the gorge and our organic garden. For entertainment there is a Freeview LCD TV and DVD player, which also gets all the radio channels. The TV takes HDMI input so if you want to watch something from the internet on your laptop - it all works. The fully fitted kitchenette, with granite worktops and bespoke reclaimed pine units, has everything you need including gas hob, fan oven and grill, refrigerator with freezing compartment and a range of appliances including microwave oven, toaster and kettle. Ample pots, pans, utensils, and full set of crockery, glasses and cutlery. There is no washing machine in the cottage but you can use the main house machine for a small charge, or use the great laundrette service in the village. Again windows in all directions, and discrete lighting for all needs. The bed is king sized with memory foam mattress, and supplied by Warren Evans who have a reputation for environmentally excellent products. Linen is organic Egyptian Cotton. 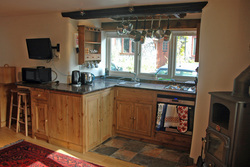 The oak floors have underfloor heating, and if the wood burner is in use then all the warmth comes upstairs too. Views from the upstairs casement and triple glazed Velux windows are fantastic - perfect to wake up to as the sun streams in in the morning. The neat fully tiled shower room includes a toilet, wash basin and spacious shower area. All you'd expect and need including large mirror, bright LED lighting and shelves for all the bits. Sadly no bath - space was too limited. The cottage has a little west-facing patio by the front door with a table and two chairs and some pot plants. It looks across to the garden and is a lovely place to catch the late afternoon sun. And the fairly large garden is open for you to sit out in, wander around and enjoy - lots of little paths and interesting corners. It is a working garden for the main house with everything grown organically and to permaculture principles.